When you think of black as a color the words stylish and sophisticated spring to mind which is one of the reasons black Christmas ornaments are so popular these days. Many people like to have a themed Christmas tree whether it’s for their home or office and black Christmas ornaments can encompass more than one theme. Buy Black Christmas Ornaments for Your Christmas Tree! Although black Christmas ornaments are far from a traditional color to use on your Christmas tree it does encompass a number of themes from glamor to Goth. Let's have a look at some of the themed Christmas trees that would look good with black Christmas ornaments. If you’ve decided that you want a vintage Hollywood themed Christmas tree then you are going to need some lovely black ornaments to create a fabulous tree. I've included a sparkly sequin black ball Christmas ornament below which just screams vintage Hollywood glamor! Black and silver Christmas ornaments are also a great addition to any Vintage Hollywood Christmas tree as the silver can add some of the sparkle that any matte black ornaments can miss. A combination of individual plain black and plain silver ornaments are also a good idea for this type of tree. I actually saw a vintage Hollywood Christmas tree in a shop a couple of years ago and they had found a Christmas tree topper of a lady in a red evening dress which really stood out against the black and silver ornaments that they used - it looked sensational! You can add a few ornaments of your favourite movie stars to the tree as well as the black and white ornaments for an extra special touch. Stars such as Frank Sinatra, Grace Kelly, Cary Grant, Elvis Presley, James Dean and Marilyn Monroe to name just a few would look great on an essentially black and silver decorated tree. Tuxedos are traditionally black so if you’re going for a sophisticated black tie event styled Christmas tree you’ll need some really sophisticated black Christmas ornaments and maybe a few gold ones or black and gold Christmas ornaments to add a little more color on your tree. This type of themed Christmas tree really oozes sophistication and is great for any Christmas cocktail parties or office parties. If you're going for this style of tree then instead of adding tinsel you could drape a black feather boa around the tree or the strand of bead style of decoration in a black, cream or totally different color. There are some really stunning black and gold Christmas ornaments which can help add a touch of opulence to the rest of the black ornaments that you use. Now some people like to use black Christmas trees for their touch of Christmas Goth, but another solution is to add black Christmas ornaments combined with a couple of splashes of dark red or purple or a few Gothic inspired ornaments. There are some great Gothic fairy ornaments or you can just use black bat ornaments (as I've featured below). The look is really easily obtained and it’s amazing how great a Gothic inspired Christmas tree can look for Halloween or Christmas – spread out the use of your décor with ornaments that can be utilized from October through December! I am sure that there are countless other themes that call for black Christmas ornaments that I haven't thought of here. Black is one of those colors that plays well with others so no matter what color you'd like your Christmas tree to be black is bound to be a color that can compliament it. It's because black is a color that mixes so well with others that there are so many Christmas ornaments available which incorporate black and other colors. As you can see on this page there are black and silver Christmas ornaments as well as black and gold Christmas ornaments. Other colors that I have seen combined are black and red, black and purple and black and pink so you don't have to go pure black for your Christmas ornaments. 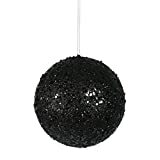 If you want a solely black ornament then I think that the black ball Christmas ornament with the sequins and beads is probably the most striking out of them. The sequins will pick up Christmas lights really well, which is good, so having them dotted around your tree will give you that touch of sparkle. 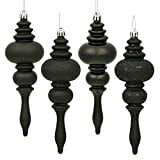 Black Christmas ornaments come in all different shapes and sizes themselves from the traditional ball style to finials, icicles and more. Black shoes of different styles are available as a Christmas ornament as well as other clothing items, why I have seen black lingerie and even a black leather jacket as unusual black Christmas ornaments. They Look Great on My Christmas Tree! I actually was sent a set of black Christmas ornaments a couple of years ago from my hubby's sister and they donned our Christmas tree last year. Unfortunately I couldn't find any available to purchase online or I would've linked to them for you. They were black balls with the silver fern on each of them.............did I tell you my hubby's a Kiwi? He loved them and they went well with the All Black Santa Christmas ornament I gave him a few years ago! My daughter spotted a gorgeous black Christmas ornament in the post Christmas sales this year, but she left it on the shelf while we looked at some other things and it was gone when we were heading to the checkout so it looks like the only black on our tree this year will be from our Kiwi ornaments - what about your Christmas tree? Will You Be Hanging Any Black Christmas Ornaments on Your Tree This Year? Stunning with a white or pink Christmas tree. And you see quite a few of those these days! I have to admit I have nothing in black for the Holidays, but the door is not closed to it. I don't think so unless whichever grandchild is supposed to decorate the tree decides to do that. I could see a silver or white Christmas Tree with black ornaments on it. That would look really cool. I don't think they would show up on our little 3 ft dark green Christmas tree that the kids decorate. I never thought of black ornaments, I have never seen them and don't know if I can get them here. Black ornaments are definitely interesting. I can see the black being elegant and toning down some of the brighter colors. My brother's tree usually looks like something from Halloween. I'm too much of a traditionalist to go black.